Illegal dumping, also called fly dumping or fly tipping, is the dumping of waste illegally instead of using an authorised method such as kerbside collection or using an authorised rubbish dump. It is the illegal deposit of any waste onto land, including waste dumped or tipped on a site with no licence to accept waste. 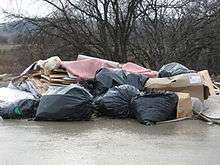 ↑ "Illegal Dumping". Brampton.ca. 2010-10-07. Retrieved 2013-07-28. ↑ "Illegal Dumping Info". Rdek.bc.ca. 2011-08-30. Retrieved 2013-07-28. ↑ "City of Chicago :: Environment". egov.cityofchicago.org. Retrieved 2010-08-18. 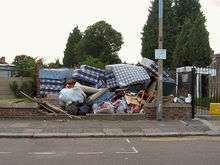 ↑ "UK fly-tipping 'on massive scale'". BBC. 2007-03-19. Retrieved 2008-12-16. Fly-tipping is taking place on a "massive scale" across the UK, the Countryside Alliance has warned. Some 2.5m cases of illegal dumping were recorded between April 2005 and 2006, it said, with 1,249,527 incidents reported in Liverpool alone. ↑ fly-tipping, n. Oxford English Dictionary, online edition, November 2010. Retrieved: 2011-01-28.